(CNN) -- "Teen Spirit" and "Good Times" may be coming to the Rock and Roll Hall of Fame -- sealed with a KISS. 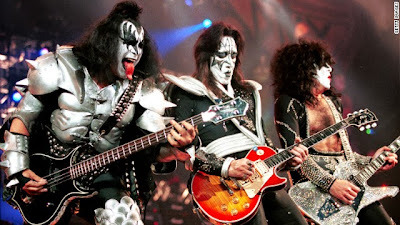 Grunge groundbreakers Nirvana, disco dynamos Chic and the costume-clad, Gene Simmons-led pop metal band KISS are among 16 nominees up for election in the museum's Class of 2014. The deep selection also includes '70s and '80s hitmakers Hall and Oates; college radio heroes the Replacements; New Orleans funkmeisters the Meters; sweet-voiced Linda Ronstadt; and pioneering gangsta rappers N.W.A. Completing the list: the Paul Butterfield Blues Band, Deep Purple, Peter Gabriel, LL Cool J, Cat Stevens, Link Wray, Yes and the Zombies. The list spans more than six decades of rock and pop history and includes both major pop successes -- Chic, Hall and Oates, Gabriel, Ronstadt and Yes all hit No. 1 on Billboard's Hot 100 singles chart -- and influential players. Wray, for example, had just two Top 40 singles, "Rumble" and "Raw-Hide," but his dirty, heavily distorted sound proved a precursor for every power-chording shredder who's ever picked up a guitar. "The musical equivalent of football's forearm shiver," critic Dave Marsh wrote of "Rumble" in "The Heart of Rock and Soul," his compendium of 1,001 great singles. "Short. Nasty. Potentially lethal." And N.W.A., which put out just three studio albums in its short career, made them count. The blunt "F*** Tha Police," off the second album "Straight Outta Compton," became a cause celebre upon its release in 1988 -- even the FBI was concerned enough to send letters to the group's record company -- and "Niggaz4Life," the group's final record, hit No. 1. "In many ways the most notorious group in the history of rap," writes Allmusic.com's Stephen Thomas Erlewine. Members Ice Cube, Eazy-E and Dr. Dre all went on to even bigger things, with Dr. Dre, in particular, becoming perhaps the most notable producer in hip-hop history. Rock fans may be particularly invested in the fates of Nirvana, which kicked off the grunge era with its classic 1991 album "Nevermind," and KISS, which -- despite mixed critical notices during its 1970s heyday -- built a roaring fan base called the "KISS Army" on the backs of incessant touring, pyrotechnic stage shows and several hit albums. As the Rock Hall says in a press release, "Few bands short of the Beatles inspired more kids to pick up the guitar than KISS." But the other nominees shouldn't be overlooked. Chic, known for such hits as "Le Freak" and "Good Times," was perhaps the best of the disco groups, and its leaders -- guitarist Nile Rodgers, bassist Bernard Edwards and drummer Tony Thompson -- moved smoothly into the '80s thanks to their sleek studio work. The group's sound is still prominent: Rodgers recently popped up on the Chic-like Daft Punk single "Get Lucky." And the Replacements managed to combine affecting songwriting -- usually courtesy of Paul Westerberg -- with passionate (if occasionally shambling) performances, such as those heard on the songs "I Will Dare," "Unsatisfied" and "Can't Hardly Wait." Besides, the hall may need to find a place for a band that titled an album, "Sorry Ma, Forgot to Take Out the Trash." Voting will be open to fans. Beginning continues through December 10, people can cast ballots at the Rock Hall, Rolling Stone and USA Today. Visit www.rockhall.com/vote, www.rollingstone.com and www.usatoday.com to cast ballots. The top five vote-getters will be listed on a "fans' ballot" that will be tallied along with the other ballots for the Class of 2014. The inductees are chosen by a secret ballot of 600 voters, a group that includes previous inductees, music industry veterans, historians and critics. All eligible nominees released their first single or album at least 25 years before the year of nomination. Last year's class included Rush, Randy Newman, Public Enemy, Donna Summer and Quincy Jones. The 29th Annual Rock and Roll Hall of Fame Induction Ceremony will be held in April 2014 in New York. The ceremony will be broadcast on HBO.